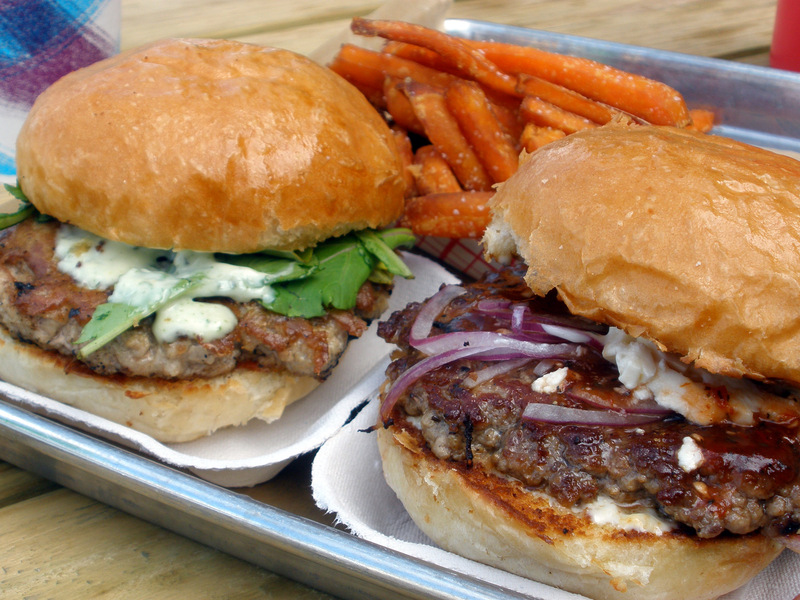 The burgers were solid: ample patties in fresh buns, dressed with interesting flavors (tomato jam, arugula, green goddess dressing for the turkey; feta, basil mayo, red onions, and chili-mint glaze for the lamb). But both missed the mark, to my palate: the sweet elements overwhelmed the savory. Next time, I’ll ask for the sugary stuff on the side. And now for the Simpsons….in case you missed last Sunday’s episode in which Marge and the kids start a food blog, I share this musical number: “Blogging a Food Blog”. Watch for Guy Fieri riding Paul Prudhomme like a kids’ hoppity ball. The video link is not to the Simpson’s, it is pointing at The Company Burger’s site. We’re of like mind on the too-sweet burger toppings. I don’t even want a sweet pickle slice on mine: dill only, please.